Birthdays have always been fun! Birthdays are special for all of us as we celebrate the happiness of our near and dear ones being a part of our life. Birthday’s although make us older, we always feel young at heart while we celebrate our birthday’s. 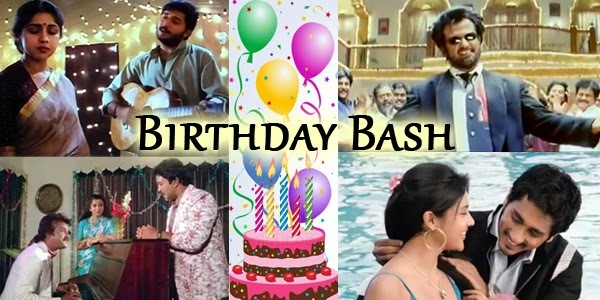 Birthday’s have been a significant part of Tamil cinema and have been used in many songs. A wonderful song is ‘Oh oh oh kick erudhey’ from the movie Padayappa where we see the Superstar is celebrating his daughter’s birthday along with his family. When it is superstar , we cannot forget another song of his from the movie Dharmathin Thalaivan, the song ‘Thenmadurai vaigainadhi’ where he is seen sharing the screen space with the ace actor Prabhu. One song that caught the attention recently in Sharreth’s music was from the movie 180, where we see the actress celebrating her birthday and the actor flooding her with gifts. This song is ofcourse as we all know is the wonderful ‘NeeKorinal’ sung by Karthik. Another song where we see the heroine in a birthday party scene is in the movie ‘Ivan vera maathiri’ which released last year. The song ‘Enna marandhean’ has caught the attention of manyand is infact created a ripple for the kind of role portrayed by the heroine. Rewinding back, another beautiful song that we cannot miss is ‘Nalam Vazha’ where we see Arvind Swami and Revathy in the scene. This song is from the movie Marubadiyum. A lovely romantic number the hero sings for the heroine on her birthday is the song ‘Vaanam vanthu’ from the movie Guru En Aalu.